We’ve all been there. “What do you want for dinner?” That dreaded question that seems to have no correct answer. But when no one can decide between burgers, Mexican, Chinese or that new place down the street, there’s one tried and true choice to make everyone happy: pizza! It’s been said that there’s no such thing as bad pizza. We’ll leave that up to you to decide, but there definitely is such a thing as good pizza, and there are some fantastic pizza places around Myrtle Beach that are sure to satisfy anyone’s appetite. Here are a few of the most delicious pizza destinations around the Grand Strand to check out during your Myrtle Beach vacation. With several locations around the Grand Strand from North Myrtle Beach to Garden City, Ultimate California Pizza is one of the most popular spots to grab freshly-baked pizza. And with an extensive menu featuring one-of-a-kind topping combinations, even the pickiest eaters are sure to find their perfect pie. You can always go with classic options like pepperoni or supreme, but why not try some of their unique signature options like the Big Sur (Canadian bacon, chicken, red onion, mushrooms and and swiss cheese), the Black and Bleu (filet mignon, portabella mushrooms, roma tomatoes, red onion and bleu cheese crumbles with pesto sauce) or the Golden (smoked ham, pineapple, green onion, chopped dates, coconut and parmesan and mozzarella blend)? Veggie lovers have a half-dozen tempting options and if for some reason pizza isn’t what you crave you can choose from oven-baked subs and pasta options. When it comes to New York style pizza, people can get pretty passionate about whether or not a restaurant’s offerings are worthy homages to authentic New York pies. But after a trip to Gino’s Real New York Pizza, even the most die-hard New York style pizza fans are sure to walk away impressed. 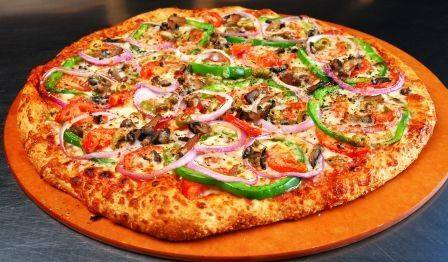 Gino’s serves up freshly baked pies and each component of your pizza is created from the freshest ingredients. It starts with fresh dough forming a warm, crispy base topped with amazing sauce and top quality mozzarella cheese, meats and veggies. For maximum flavor, try their Bada Bing, allowing you to pick your five favorite toppings heartily spread out over 16”, 18” or 20” pies. Gino’s also serves up scrumptious calzones, strombolis, oven baked subs and traditional pasta favorites like baked ziti and eggplant parmesan. Gino’s has two locations available in Myrtle Beach, at 3521 Belle Terre Boulevard and 3669 Renee Drive. For authentic brick oven pizza, you can’t beat Crave Italian Oven and Bar! Crave stokes their ovens with wood to reach 750 degrees, ensuring all their pies come out with a crispy crust and bubbling cheese. Crave features standards like a white pizza and meat lovers pizza, but branches out to more traditional Italian pizzas like their Margheriti topped with sliced tomato and fresh bocconcini mozzarella or the Chenel, topped with imported Italian goat cheese, caramelized onions, prosciutto, arugula and balsamic glaze. Vegetarians are sure to love their roasted vegetable pizza, topped with the freshest in-season veggies and baked to perfection. And if somehow your desired pie isn’t on the menu, you can always order the Crave special and pick either three or five of your favorite toppings for your pizza. Crave is open seven days a week and located at 5990 North Kings Highway in Myrtle Beach. Beyond these great options, there are dozens more fantastic spots to grab pizza all along the Grand Strand. You’re sure to find your perfect pie during your Myrtle Beach vacation. And with the great booking deals available with Beach Vacations, you can plan your late summer Myrtle Beach vacation at an unbelievably low rate! From our modern Myrtle Beach condos at Myrtlewood Villas or River Oaks Resort to our oceanfront rentals at Atlantica Resort, we offer an amazing assortment of Myrtle Beach vacation rentals for your upcoming getaway. Book today and get the best deal around on a trip to Myrtle Beach!